Tasmania is an Australian island and a state of the same name. The island is separated from the Australian mainland by the Bass Strait, a 240 kilometer (150 mile) wide stretch of water. It is south of Australia's eastern corner. 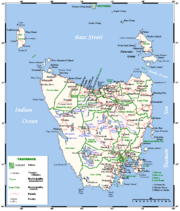 The state of Tasmania includes the island of Tasmania, nearby islands, and the sub-Antarctic Macquarie Island. The main island is 364 kilometers (226 mi) long from the northernmost point to the southernmost point and 306 kilometers (190 mi) from west to east. Tasmania's history is one of grim and sometimes brutal relations with the indigenous Aboriginal people as well as having once been a harsh convict enclave. Today, Tasmania is known for its extreme natural beauty with spectacular mountain, lake, and coastal scenery. Nearly 37 percent of the state is protected in Nature Reserves and National Parks, including more than one fifth which is designated as World Heritage Sites by UNESCO. In the 1970s, environmentalists fought a battle against dam construction on Lake Pedder. The battle spawned what many consider the world’s first Green Party, a political party based on principles including environmentalism and social justice causes, including those related to the rights of indigenous peoples. The state is named after Dutch explorer Abel Tasman, who made the first reported European sighting of the island on November 24, 1642. He named the island Anthoonij van Diemenslandt after his sponsor Anthony van Diemen, the Governor of the Dutch East Indies. The name was later shortened to Van Diemen's Land by the British. It was officially renamed in honor of its first European discoverer on January 1, 1856. The state of Tasmania is comprised of the main island, Tasmania; Bruny Island, near the southeastern coast of the main island; King and Flinders islands in Bass Strait; a number of smaller islands off the coast of the main island; and subantarctic Macquarie Island, about 1,450 kilometers (900 miles) to the southeast. Tasmania, structurally a southern extension of the Great Dividing Range, is a rugged island of temperate climate, and was considered so similar in some ways to pre-industrial England that it was referred to by some English colonists as "a southern England." Tasmania has been volcanically inactive in recent geological times and has rugged mountain ranges over much of its land area. The most mountainous regions are the Central Highlands and southwestern areas, which cover most of the central, west and southwest parts of the state. The Midlands in central east Tasmania is fairly flat by comparison and is predominantly used for agriculture, although various types of farming activity can be seen throughout the state. The West Coast has a high rainfall which powers most of the hydroelectric projects, and its earnings from mineral activities are significant. The West Coast Range has some of the better known West Coast mines on its slopes – notably the Mount Lyell mine. The Southwest region is densely forested, the National Park holding some of the last temperate rainforests in the world. Management of such an isolated and inaccessible area has been made easier and more reliable with the advent of satellite imaging. Most of the population live near the coastal rivers—the Derwent, and the Tamar and Mersey Rivers in the north. Tasmania is separated from the Australian mainland by Bass Strait, which is typically rough, primarily a result of its shallow depth (typically around 60 m) and its susceptibility to Southern Ocean currents and swells. Tasmania is located in the pathway of the notorious "Roaring Forties" wind that encircles the globe. The Tasmanian climate is extremely variable with high fluctuations in temperature and wind speed during the average week. Summer lasts from December to February when the average maximum temperature at sea level is 21 °C (70 °F). Winter is from June to August with an average maximum temperature at sea level of 12 °C (54 °F). Inland, temperatures are much cooler. Liawenee, on the Central Plateau, is regarded as the coldest place in Australia with temperatures even in February ranging between 4 °C (39 °F) to 17 °C (63 °F). In winter, the Central Plateau ranges from around −2 °C (28.4 °F) to 3 °C (37 °F). Rainfall in Tasmania follows a complicated pattern rather analogous to that found on large continents at the same latitude in the northern hemisphere. On the western side rainfall increases from around 160 centimeters (63 in) at Strahan on the coast up to 270 centimeters (110 in) at Cradle Valley in the highlands. Further east in the Lake Country, annual rainfall declines to around 90 centimeters (35 in), while in the Midlands, annual rainfall is as low as 45 centimeters (18 in) at Ross and generally below 60 centimeters (24 in). Here the rainfall is more evenly distributed than in the west, and most months receive very similar averages. The densely populated northern coast is a much drier version of the western side, with annual rainfall ranging from 71 centimeters (28 in) at Launceston to 105 centimeters (41 in) at Burnie in the west and Scottsdale in the east. Most rain falls in winter and in summer the average can be as low as 35 millimeters (1.4 in) per month in the Lower Tamar. The east coast is wetter than the Midlands, with an average annual rainfall ranging from 100 centimeters (39 in) at St. Helens to around 64 centimeters (25 in) at Swansea. Here the rainfall is evenly distributed over the year but can be very erratic as heavy rainfalls from the warm Tasman Sea are quite frequent. The east coast is sometime called the "sun coast" because of its sunny climate; there is a rain shadow caused by the prevailing westerly winds. Despite the presence of some Quaternary glaciation, Tasmania's soils are no more fertile than those of mainland Australia, largely because most are severely leached and the areas with driest climate (thus least leaching) were unaffected by glaciation or alluvia derived therefrom. Most soils on the Bass Strait Islands, the east coast and western Tasmania are very infertile Spodosols or Psamments, with some even less fertile "lateritic podzolic soils" in the latter region. Most of these lands are thus not used for agriculture, but there is much productive forestry—which remains the economic mainstay of the state. On the north coast, apart from some relatively fertile alluvial soils used for fruit growing, there are also deep red, easily workable soils known as "krasnozems" ("red land"). These soils are highly acidic and fix phosphate very effectively, but their extremely favorable physical properties make them extensively used for dairying, beef cattle and fodder crops. Mountain Ash, the world's tallest flowering plant. Tasmania has extremely diverse vegetation, from the heavily grazed grassland of the dry Midlands to the tall evergreen eucalyptus forest, alpine heathlands and large areas of cool temperate rainforests and moorlands in the rest of the state. 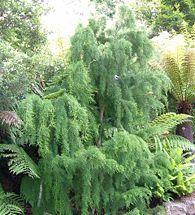 Many flora species are unique to Tasmania, while some are related to species in South America and New Zealand through ancestors which grew on the super continent of Gondwana, 50 million years ago. The tallest trees in Australia are found in the Styx Valley. Mountain Ash—a type of Eucalyptus—on the island are more than 90 meters (300 ft) tall. As these are still growing, there is hope they will surpass the tallest tree ever measured in the country, a Mountain Ash growing at Thorpdale, Victoria measuring more than 112 meters (370 ft) before it was felled in 1884. Captive Tasmanian Tigers (now extinct) in a zoo. The island of Tasmania was home to the Thylacine, a marsupial which resembled a wild dog. Known colloquially as the Tasmanian Tiger for the distinctive striping across its back, it became extinct in mainland Australia much earlier because of competition by the dingo, introduced in prehistoric times. Owing to persecution by farmers, government-funded bounty hunters and, in the final years, collectors for overseas museums, it appears to have been exterminated in Tasmania. The last known animal died in captivity in 1936. Many alleged sightings have been recorded, none of them confirmed. The Tasmanian Devil is a carnivorous marsupial found exclusively on the island of Tasmania. 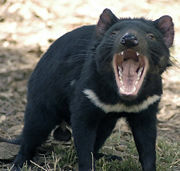 The size of a small dog but stocky and muscular, the Tasmanian Devil is characterized by black fur with white patches. It has a loud and disturbing screech-like growl, possesses a vicious temperament and is predominantly a scavenger. The Devil survived European settlement and was considered widespread and common throughout Tasmania until recently. Like a lot of wildlife, fast vehicles on roads are a problem for Tasmanian Devils, which are often killed while feeding on other road-killed animals such as wallabies. As of 2005, the Tasmanian Devil population had been reduced by up to 80 percent in parts of Tasmania by the devil facial tumor disease, which is gradually spreading throughout the island. It is believed the majority of deaths were caused by starvation when the tumors spread to their mouths. Tumors are spread by fighting between the animals over carcasses they feed on—typically, fighting devils will bite one another's faces. There is no known cure for the disease, and intensive research is underway to determine its cause. There is also a captive breeding program being undertaken by the Tasmanian government to establish a disease-free, genetically-diverse population of Tasmanian Devils outside Tasmania, which has been relatively successful. 1 rail (family Rallidae)—the Tasmanian Native-hen, Australia's only flightless land bird other than the giant ratites (Emu and Southern Cassowary). The endemic Tasmanian Emu was exterminated in the mid-nineteenth century. The Tasmanian Wedge-tailed Eagle is a threatened endemic subspecies. Tasmania is home to eleven species of frog. Three of these are found only in Tasmania, the Tasmanian Tree Frog (Litoria burrowsae), the Tasmanian Froglet (Crinia tasmaniensis) and the recently discovered Moss Froglet (Bryobatrachus nimbus). Of the 11 species that inhabit Tasmania all are native to Australia. Tasmania is home to the largest breeding population of Growling Grass Frogs (Litoria raniformis), a vulnerable species, which has declined over much of its range. It is believed that the island of Tasmania was joined to the mainland until the end of the last glacial period approximately 10,000 years ago. Much of the island is composed of Jurassic dolerite intrusions (upwellings of magma) through other rock types, sometimes forming large columnar crystals. Tasmania has the world's largest areas of dolerite, with many distinctive mountains and cliffs formed from this rock type. The central plateau and the southeast portions of the island are mostly dolerite. Mount Wellington above Hobart is a good example, showing distinct columns known as the Organ Pipes. In the southwest, Precambrian quartzites are formed from very ancient sea sediments and form strikingly sharp ridges and ranges, such as Federation Peak or Frenchman's Cap. In the northeast and east, continental granites can be seen, such as at Freycinet, similar to coastal granites on mainland Australia. In the northwest and west, mineral rich volcanic rock can be seen at Mt. Read near Rosebery, or at Mt. Lyell near Queenstown. Also present in the south and northwest is limestone with some magnificent caves. The quartzite and dolerite areas in the higher mountains show evidence of glaciation, and much of Australia's glaciated landscape is found on the Central Plateau and the Southwest. Cradle Mountain, another dolerite peak, for example, was a Nunatak. The combination of these different rock types offers incredible scenery, much of it distinct from any other region of the world. 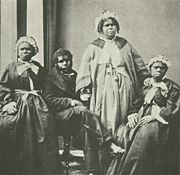 A picture of the last four "full-blooded" Tasmanian Aborigines c. 1860s. Truganini, the last to survive, is seated at far right. 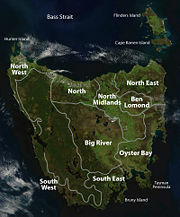 Tasmania was first inhabited by the Tasmanian Aborigines, and evidence indicates their presence in the region, later to become an island, at least 35,000 years ago (rising sea levels cut Tasmania off from mainland Australia about 10,000 years ago). The Aboriginal people in Tasmania were divided into nine main ethnic groups. The indigenous population at the time of British settlement in 1803 has been estimated at between 5,000 and 10,000 people, but through war, persecution, and disease, the population had dwindled to 300 in 1833. The entire indigenous population was moved to Flinders Island by George Augustus Robinson. Truganini (1812-1876) is generally recognized as the last full-blooded Tasmanian Aborigine, although there is strong evidence that it was in fact Fanny Cochrane Smith, who was born at Wybalena and died in 1905. The first reported sighting of Tasmania by a European was on November 24, 1642, by the Dutch explorer Abel Tasman. Captain James Cook also sighted the island in 1777, and numerous other European seafarers made landfalls, adding a colorful array to the names of topographical features. The first settlement was by the British at Risdon Cove on the eastern bank of the Derwent estuary in 1803, by a small party sent from Sydney, under Lt. John Bowen for the purpose of preventing the French from claiming the island. An alternative settlement was established by Captain David Collins 5 kilometers (3.1 mi) to the south in 1804, in Sullivan's Cove on the western side of the Derwent, where fresh water was more plentiful. The latter settlement became known as Hobart Town or Hobarton, later shortened to Hobart, after the British Colonial Secretary of the time, Lord Hobart. The settlement at Risdon was later abandoned. The early settlers were mostly convicts and their military guards, with the task of developing agriculture and other industries. Numerous other convict-based settlements were made in Van Diemen's Land, including secondary prisons, such as the particularly harsh penal colonies at Port Arthur in the southeast and Macquarie Harbour on the West Coast. Van Diemen's Land was proclaimed a separate colony from New South Wales, with its own judicial establishment and Legislative Council, on December 3, 1825. 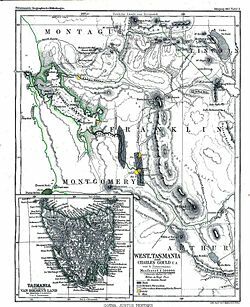 Colonial self-government came into existence in 1855–1856 and Tasmania became the colony’s official name. The 1860s and early 1870s were economically depressed. Tin was discovered in the 1870s, and with the discovery of copper in the 1890s, a mining boom followed. At the same time small-scale farming and orcharding took hold, and roads and railways were developed. In the early twentieth century, hydroelectric power came to the island. This made possible the construction of a large zinc refinery near Hobart following World War I. Soon to follow were textile mills and a major confectionery plant. The Great Depression did not bypass Tasmania. Tasmania's Labor Premier at that time, Albert George Ogilvie, worked to procure federal grants to support capitalization projects, which softened the effect of the Depression. Roads were built and hydro-industrialization progressed. This, along with mining and forestry and Australia's general prosperity, benefited Tasmania. Through the 1970s, the state prospered. The growth of industry prompted increasing penetration into Tasmanian wilderness. More than ever, the economy seemed to depend on the exploitation of natural resources, especially timber and metals. Soon an environmental movement was born and developed into a considerable force. In the 1970s, the state government announced plans to flood environmentally significant Lake Pedder for dam construction. Environmentalists fought its construction and failed, but the battle spawned what many consider the world’s first Green Party, the United Tasmania Group, later known as the Tasmanian Greens. At the same time, growth of the Aboriginal movement occurred. Tasmanian Aborigines, thought by many to be extinct, began to assert their identity. They received the support of federal aid and by the mid-1990s several historic and cultural sites in the state were returned to the Aboriginal community. In 1998, James Bacon of the Australian Labor Party was elected. His six year tenure saw improvement in the areas of finance, infrastructure, tourism, unemployment rates, and the funding of health, child care, and other social services. While the state experienced prosperity, conflict increased between environmentalist and pro-development forces. The form of the Government of Tasmania is prescribed in its Constitution, which dates from 1856, although it has been amended many times since then. Since 1901, Tasmania has been a state of the Commonwealth of Australia, and the Australian Constitution regulates its relationship with the Commonwealth. 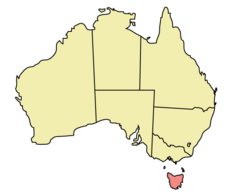 Tasmania is governed according to the principles of the Westminster System, a form of parliamentary government based on the model of the United Kingdom. Legislative power rests with the Parliament of Tasmania, which consists of the Crown, represented by the Governor of Tasmania, and the two Houses, the Tasmanian Legislative Council and the Tasmanian House of Assembly. Executive power rests formally with the Executive Council, which consists of the Governor and senior ministers. In practice executive power is exercised by the Premier of Tasmania and the Cabinet, who are appointed by the Governor, but who hold office by virtue of their ability to command the support of a majority of members of the House of Assembly. Judicial power is exercised by the Supreme Court of Tasmania and a system of subordinate courts, but the High Court of Australia and other federal courts have overriding jurisdiction on matters which fall under the ambit of the Australian Constitution. Tasmania's House of Assembly is the lower house of the Tasmanian parliament. There are five House of Assembly divisions: Bass, Braddon, Denison, Franklin and Lyons. These divisions have the same boundaries as the five Commonwealth House of Representatives divisions for Tasmania. There are twenty-five members of the House of Assembly, with five members elected for each of the divisions using the Hare-Clark voting system of multi-member proportional representation. Members are elected for a term of up to 4 years. Tasmania's Legislative Council is the upper house of the Tasmanian parliament. It has 15 members, each representing one of the following 15 electoral divisions: Apsley, Montgomery, Rosevears, Derwent, Murchison, Rowallan, Elwick, Nelson, Rumney, Huon, Paterson, Wellington, Mersey, Pembroke and Windermere. The boundaries of the current divisions are determined by the Legislative Council Redistribution Tribunal. Elections are conducted on a 6 year periodic cycle. Elections for 3 members are held in May one year, with elections for 2 members held in May the following year and so on. Local Government elections are conducted under the Local Government Act using the Hare-Clark voting system of multi-member proportional representation. Elections for Mayor, Deputy Mayor and half the councillor positions are held during September and October in each uneven numbered year. Tasmania has twenty-nine local government areas. These include six cities (three in greater Hobart, one covering each of Launceston, Burnie and Devonport) and twenty-three municipalities. The largest council (by number of enrolled electors) is City of Launceston and the smallest council is Municipality of Flinders (which serves the Flinders Island and surrounding islands, and has just over 800 electors). Traditionally Tasmania's main industries have been: mining, including copper, zinc, tin, and iron; agriculture; forestry; and tourism. Significantly in the 1940s and 1950s there had been a notion of 'Hydro-Industrialization' embodied in the state by Hydro Tasmania. These all have had varying fortunes over the last century and more, involved in ebbs and flows of population moving in and away dependent upon the specific requirements of the dominant industries of the time. The state has a large number of food exporting sectors, including but not limited to seafood (for example, Atlantic salmon, abalone, and crayfish). There had been a decline in manufacturing during the 1990s, leading to a drain of some of the island's trained and experienced working population to mainland Australia. The major urban centers such as Melbourne and Sydney are popular destinations. Since 2001, Tasmania has experienced a positive turnaround. Favorable economic conditions throughout Australia, cheaper air fares and two new Spirit of Tasmania ferries have all contributed to what is now a booming tourism industry. A significant number of Tasmanians work for the government. Other major employers include the Federal Group, owner of several hotels and Tasmania's two casinos, and Gunns Limited, the state's largest forestry company. The thrust of the environmental lobby has resulted in large areas of the state being conserved in national parks and other protected areas thus limiting economic development through means of industries such as forestry and mining as well as new places of settlement for future population growth. The position of the environmentalist lobby is that such developmental limitation is offset by enhanced tourism prospects. 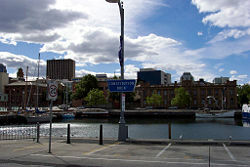 Given its island setting and dispersed development, transportation is especially important to Tasmania. The main air carriers are Qantas and its subsidiary Jetstar, and Virgin Blue, which fly direct routes to Melbourne, Sydney, Brisbane, and Adelaide. Low cost airline Tiger Airways commenced services between Melbourne and Launceston in November 2007 and Hobart in January 2008. Major airports include Hobart International Airport and Launceston Airport; the smaller airports, Burnie (Wynyard), serviced by Regional Express and Devonport, serviced by QantasLink have services to Melbourne. The domestic sea route is serviced by Bass Strait passenger/vehicle ferries operated by the Tasmanian Government-owned TT-Line (Tasmania). From 1986 the Abel Tasman made six weekly overnight crossings between Devonport and Melbourne. It was replaced by the Spirit of Tasmania in 1993, which performed the same route and schedule. The most recent change was the 2002 replacement of the Spirit by two Superfast ferries—Spirit of Tasmania I and Spirit of Tasmania II—which brought the number of weekly overnight crossings to fourteen, plus additional daylight crossings in peak times. Two container ships owned by Toll Shipping also make daily crossings between Burnie and Melbourne. The port of Hobart also serves as a host to visiting cruise ships. The state is also home to International Catamarans, a manufacturer of very high-speed aluminum vessels (commonly known as SeaCat) that regularly broke records when they were first launched. The state government tried using them on the Bass Strait run but eventually decided to discontinue the run because of concerns over viability and the suitability of the vessels for the extreme weather conditions sometimes experienced in the strait. Hobart has the second deepest natural port in the world, second to only Rio de Janeiro in Brazil. The settled areas of Tasmania have an extensive network of good-quality roads, the primary form of transport. Since the 1980s, many of the state's highways have undergone regular upgrades. These include the Hobart Southern Outlet, Launceston Southern Outlet, Bass Highway reconstruction, and the Huon Highway. Rail transport in Tasmania consists of narrow gauge lines to all four major population centers and to mining and forestry operations on the west coast and in the northwest. Services are operated by TasRail, a Pacific National subsidiary. Regular passenger train services in the state ceased in 1977; the only trains are for freight, and there are tourist trains in specific areas, for example the West Coast Wilderness Railway. Tasmania's population is distributed in three main regions: The southeast coast around the capital city of Hobart, which has approximately 40 percent of the state's population; northeast centered on Launceston; and northwest which features the cities of Devonport and Burnie. Most Australians are descended from nineteenth and twentieth century immigrants from Great Britain and Ireland. Australia's population has quadrupled since the end of World War I, spurred by an ambitious immigration program. In 2001, the five largest groups of the 27.4 percent of Australians who were born overseas were from the United Kingdom, New Zealand, Italy, Vietnam, and China. A policy of multiculturalism has been established to promote racial harmony. English is the country's official language. Australian English is the only language spoken in the home for around 80 percent of the population. School attendance is compulsory in Tasmania between the ages of six and 16 years, contributing to an adult literacy rate of 99 percent. Government grants have helped establish and fund Australia's 38 universities. Several private universities exist. There is a state-based system of vocational training colleges, known as Technical and Further Education Institutes, and trades conduct apprenticeships. Approximately 58 percent of Australians between the ages of 25 and 64 have vocational or tertiary qualifications. In order to foster tourism, the state government encourages or supports several different annual events in and around the island. 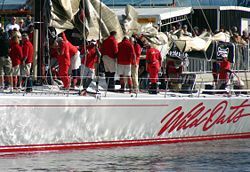 The best known of these are the Sydney to Hobart Yacht Race, starting on Boxing Day in Sydney and usually arriving at Constitution Dock in Hobart around three to four days later, during the Taste of Tasmania, an annual food and wine festival. Other events include the road rally Targa Tasmania which attracts world-class rally drivers and is staged all over the state over a period of five days. Rural or regional events include Agfest, a three-day agricultural show held at Carrick (just west of Launceston) in early May; and the Royal Hobart Show and Royal Launceston Show, both held in October annually. Music events held in Tasmania include the Falls Festival at Marion Bay (a Victoria event now held in both Victoria and Tasmania on New Year's Eve), and the Southern Roots Festival held in Hobart each Easter. A recent addition to the state has been the 10 Days on the Island arts festival. Tasmania has a varied musical scene, ranging from the Tasmanian Symphony Orchestra whose home is the Federation Concert Hall, to a substantial number of small bands, orchestras, string quintets, saxophone ensembles and individual artists who perform at a variety of venues around the state. Tasmania is also home to a vibrant community of composers including Constantine Koukias, Maria Grenfell and Don Kay, who is the patron of the Tasmanian Composers Collective which is the representative body for composers in Tasmania. Tasmania is also home to one of Australia's leading new music institutions, IHOS Music Theatre and Opera and gospel choirs, the Southern Gospel Choir. Death Metal band Psycroptic hail from Tasmania and are one of the most prominent Australian metal bands. Apart from the Classical musical season, two of the highlights of the musical year are the Falls Festival held during the summer holidays and the Carols by Candlelight held in the weeks prior to Christmas. Sports are an important part of Tasmanian culture. The only Tasmanian team in a major national sport is the Tasmanian cricket team which play in Australian domestic competitions. 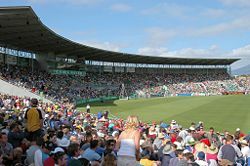 Australian rules is also a significant sport in Tasmania where Launceston regularly hosts home games of Hawthorn in the AFL. However, in 2008 the Tasmanian Government submitted a proposal to the AFL for a Tasmanian AFL Team to be admitted into the competition. Tasmania possesses forest, mineral, tourist, and water resources. It also produces a major portion of the nation's hydroelectricity. Its diversity of economic activities and stable labor relations would seem to portend a strong economy. However it is limited by small local markets and difficulties in export transportation, and remains one of Australia's poorest states. While its natural resources are bountiful, the exploitation of such is limited due to its strong environmental consciousness. Nearly 37 percent of the state is protected in Nature Reserves and National Parks, including more than 20 percent designated as World Heritage Sites by UNESCO. Its spectacular mountain, lake, and coastal scenery draws tourists as well as immigrants interested in a natural lifestyle. The state is somewhat isolated from the rest of the country, making for a political, economic, and social life distinctive from that on the mainland. It has developed a thriving, though under-resourced, arts community and environmental movement. However, the latter has proven to be as much a divisive as an inclusive issue in respect to both Tasmania's sense of identity and daily life. It is important for a balance to be struck between economic progress and care and protection of the environment. It may be found that harmony between the two camps leads to concessions on both sides. The island may possibly not become as economically prosperous as other locations, but given the assets and beauty of the natural environment its people may nonetheless count their lives abundant. ↑ Australian Bureau of Statistics, 5220.0 – Australian National Accounts: State Accounts, 2009–10. Retrieved January 28, 2012. ↑ Australian Bureau of Statistics, 3101.0 – Australian Demographic Statistics, Jun 2010, 21 December 2010. Retrieved January 28, 2012. ↑ LISTmap (Mount Ossa). Tasmanian Government Department of Primary Industries and Water. Retrieved October 6, 2007. ↑ Proclamation of Tasmanian floral emblem, Tasmanian Government Gazette, 27 November 1962. Retrieved January 28, 2012. ↑ Tasmanian State Emblems, Government of Tasmania, 29 January 2003. Retrieved January 28, 2012. ↑ Proclamation of Tasmanian mineral emblem, Tasmanian Government Gazette, 4 December 2000. Retrieved January 28, 2012. ↑ Parliament of Tasmania, Becoming Tasmania. Retrieved September 4, 2008. ↑ Department of Primary Industries and Water, Native Conifers of Western Tasmania. Retrieved September 4, 2008. ↑ International Society of Arboriculture Australia Chapter, Australia's Biggest, Tallest and Oldest Trees. Retrieved September 4, 2008. Alexander, Alison (ed.). 2005. The Companion to Tasmanian History. Centre for Tasmanian Historical Studies, University of Tasmania, Hobart. ISBN 186295223X. Department of Environment, Parks, Heritage and the Arts. Parks and Wildlife Service, Tasmania. Retrieved September 4, 2008. NASA Earth Observatory. Tasmania. Retrieved September 4, 2008. Robson, L.L. 1983. A History of Tasmania. Volume I. Van Diemen's Land From the Earliest Times to 1855. Melbourne: Oxford University Press. ISBN 0195543645. Robson, L.L. 1991. A History of Tasmania. Volume II. Colony and State From 1856 to the 1980s. Melbourne: Oxford University Press. ISBN 0195530314. This page was last modified on 14 October 2016, at 19:24.